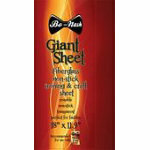 Notions > Bo Nash Giant Sheet 12"x18"
Big enough for any project Made of a fiberglass non stick surface is perfect for using with Angelina Fibers, Applique and other craft projects. Allows you to iron over embellishments like iron on transfers, glitter paints and delicate fabrics. Nothing sticks to it ...nonwovens, fusibles, paints, varnishes and glues just peel off Transparent. Can be bent or folded resists cracking and spliting with use. Lifetime Warranty through the Bo Nash Corporation.